Scott Santens - What Happens When We Give People a Basic Income? Mike: Alright, bit of an introduction about basic income. Basic income is the concept of unconditionally giving every citizen or resident of a country a liveable amount of money [00:01:00] on a regular basis. This is not the same as welfare or other social programs, because every citizen would receive this amount regardless of their life circumstances. This is also not the same as socialism. People from all over the political spectrum support the concept. Recent pilot programs of basic income have shown promising results and the idea has been getting a lot of traction in recent years. 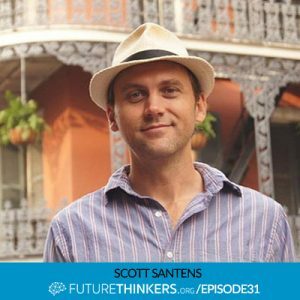 Our guest today is Scott Santens, he’s a writer, and advocate of basic income, and he’s a moderator of the basic income sub reddit. 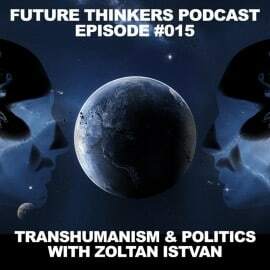 [00:01:30] I’m excited to talk about this one because we’ve had a lot of discussions recently with friends, there’s a lot of things going on all over the world in different countries where people are experimenting with basic income and it’s a really, really exciting concept. Enjoy the show. Thanks for joining us, it’s good to have you. Mike: Why don’t we start by maybe you can tell us a bit about your background with basic income and why you got into it? Scott: I’ve been a long time redditor. There was a thread that hit the front page back in 2013. [00:02:00] It really got my attention. It got, of course, many people’s attention that day. It was about just how quickly technology is advancing and yet how so few people really understand or even know just that rate to how quick it is. I was always a fan of technology, too, yet there was stuff in here that even surprised me. 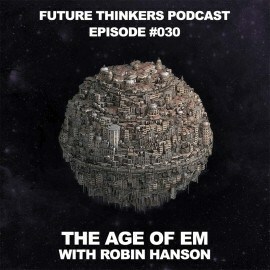 I had no idea that there were robot trucks already driving around, [00:02:30] and that there were companies that had the explicit goal of automating all their trucks by 2020 because you can that, because you’re on private land and not on roads and stuff. That kind of thing that got me really thinking about this. 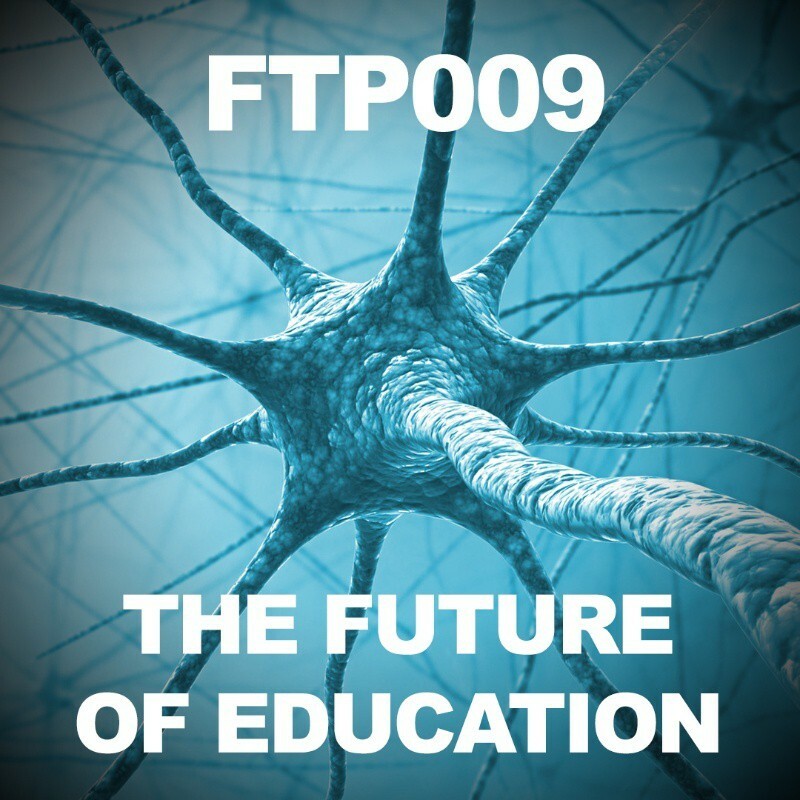 What do we do when we’re looking towards this future where technology is doing so much more labour for us? When it’s replacing, essentially, labour with capital. So, you’re [00:03:00] going towards this future where inequality is going to keep on getting bigger. Instead of people being better off as they should be when machines are doing so much more of their labour, they’re not better off, they’re worse off. So, that’s the direction that we’re going and that really got me looking into this as to what other options do we have. It was a good example of how we’ve looked at this already and we already know some things about it, like the effects of work disincentive and how that’s not really the issue people think it is. How it helped reduce cost of healthcare in Canada with lower hospitalization rates of 8.5 percent in Dauphine. How young teenagers shifted from work to school. These kind of effects that we know about [00:04:30] but aren’t really talking about. I was not aware that we even tested this in the US. I was not aware that we almost had a version of it under Nixon in 1970. I did not know that something had passed the house and failed the senate. There were so many things that I did not know until I really started looking into this. Yeah, it’s been a heck of a ride, just finding all the information there is out there and really trying to accelerate this discussion. I just think it’s really important. Euvie: Yeah. It seems like it’s been mostly an [00:05:00] ideological discussion up until very recently, and now people are kind of waking up and realizing, “We actually might have to do this.” It’s becoming almost a necessity. Scott: Yeah, exactly. For the longest time we could always have eliminated poverty. 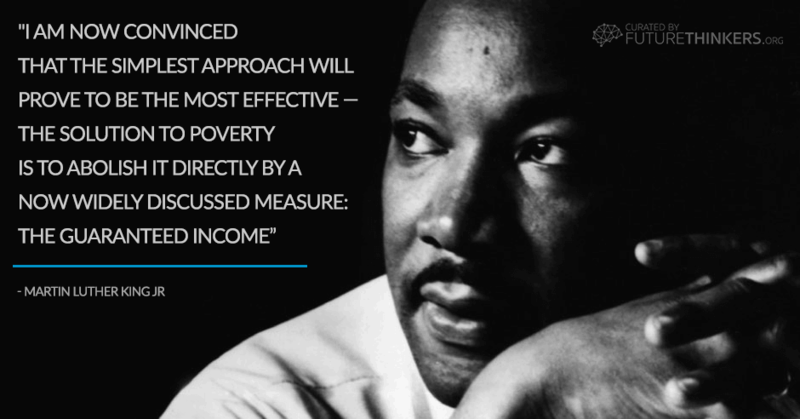 We could always have looked at this in that way and said, “Well, this is the right thing to do.” Back in the 1970s, that was the way that we were looking at it in this war against poverty. But now the conversation is different, it’s avoidance of technological change [00:05:30] and what’s interesting, too, is that that still itself is a false argument. This idea that we need to do this because of technology that’s right around the corner. The fact is that technology has been affecting us for decades. It underlies globalization, it enables it, and technology is already replacing manufacturing work. We’ve just been finding ways to shift our work from the manufacturing sector to the service sector. We’ve shifted medium skilled jobs to [00:06:00] low skill jobs in order to keep the system going. Of course, that just results in lower incomes, it results in a slowing economy. It results in lower consumption because people can’t afford to buy anything. So, the system is already being negatively affected my technology. It’s just a lot of people either don’t know that or just kind of ignore that. Mike: Why don’t we get the standard questions out of the way here like how does a basic income get implemented? Scott: My favourite way of going about this is, first of all, we have to recognize that [00:06:30] we already are spending a lot of money in our current programs. Not only on things like welfare and housing assistance and food assistance and these kinds of things, but also, we are spending money on tax credits that we don’t need to be spending on tax credits. This is welfare for the middle class and the rich that we don’t call welfare. We’ve got all these loopholes and subsidies [00:07:00] and all these things that they don’t need to be done the way that we’re doing them. Why are we giving, say, billions of dollars to the agricultural industry so that food is cheaper instead of just giving money to people so that they can afford the food? We’re distorting markets in a way that actually affects the entire world. What happens when we make cheap corn and then we dump it onto the world market? Then all of a sudden, we put people out of jobs all over the world? It’s something that’s very distortionary in a globalized market. [00:07:30] So, we want to change the way that we do things like that. So, if we do that then there is a lot of money there for basic income that we’re already generating. On top of that, there is a requirement for additional revenue if we want a full basic income, which is what I recommend, of say, in the US, a $12,000 per adult basic income or $4,000 for anyone under 18. This is something that will cost money but, at the same time, [00:08:00] it’s not as high as people think it is. We could do this by, say, just introducing, in the US, like a 10 percent value added tax in combination with carbon taxes and the financial transaction tax of less than one percent. We could do this with land value taxes. We could even do this with citizen [inaudible [0:08:20], and this is a concept that a lot of people aren’t familiar with which it that right now banks are the ones creating, essentially, all of our money. [00:08:30] We print some money but it’s not the government that is creating the money, it’s the banks. So, we are allowing private institutions to create our money supply and profit from it with interest, which is kind of I think ridiculous to me. So, we should instead create money itself publicly, because it is a public good and if we do that, if we shift that ability from banks to the actual government to create money that we need in the economy, we can lower the amount [00:09:00] of taxes we need to raise because, essentially, we could give everybody, let’s say, $100 a month or $200 a month in newly created money. Which would not be inflationary because, again, we’re replacing the money that we’re already creating via banks. So, we could do that. Then, of course, that would lower the bill from what we would need to raise for $1,000 a month to $800 a month. That’s just another, I think, smart way of going about this and, again, creating an added change that I think makes sense from what we do right now. Euvie: [00:09:30] The interesting thing, you know, I was looking at all the charts that you have on your Imager account and it’s interesting to see that actually some of the wealthiest people pay the least taxes because they’re able to lobby for tax deductions or arbitrage. Whereas, the majority of the population is not able to lobby for those things and affect those laws. So, if we take away some of those loopholes, I think we’d be able to recover massive amounts of tax that could go into [00:10:00] the government instead of being in the hands of the 85 richest people in the world. Scott: Yeah, for sure. It also recognizes, too, that right now the richest pay the least because they’re essentially paying taxes on mostly unearned income because the income that most of their income is coming from carried interest loophole and from capital gains. This is not work, this is not taxed on hard work that people claim. This is tax on unearned income, it’s money earning money. [00:10:30] For some reason, they’re not seen as lazy for doing this. We see it totally differently. The fact is that as we go into this future where, again, capital replaces labour, this is centralizing a concentrating of income at the top, because they’re the ones who own the technology. It only makes sense that if they should be paying taxes on that. It would make more sense to actually tax capital gains at a higher rate [00:11:00] than this lower rate that we’re doing right now. Euvie: Why don’t we talk about the practical benefits of basic income? You’ve mentioned teenagers staying in school longer and not dropping out as much. What are the other benefits, especially in terms of what’s been studied and what’s been shown in practice? Scott: This could go back to the cost conversation, too. Like you mentioned, this creates a healthier population. There is a connection between income and health. We know that connection exists [00:11:30] and we know that one of those examples is reduced hospitalization rates. But, again, because income is related, this will reduce rates of cancer, of diabetes, of all these stress related diseases out there. Effectively diseases for the poor are also even… inequality has a lot to do with this, as well. There are a lot of costs in this system that we can save by making a healthier population. Another example actually from evidence that we have, this is from both the negative income [00:12:00] taxes [inaudible [0:12:01] and also in Alaska, access to income for pregnant mothers means that when their babies are born, they’re born to healthier mothers due to better maternal nutrition. You can see that as being an affect that builds generation after generation. A healthier child born because they were born in a womb that was in a less impoverished environment, then that person is going to grow up to be a healthier adult. They’re going to have their own kids [00:12:30] and that will, in turn, go down the line. So, this is a very long-term affect. Aside from health, if you look at the cost of crime. That’s also very expensive. It’s been estimated that we spend over, in the US, a trillion dollars per year on the costs of crime. This is not only, let’s say, the avoidance of prison itself and the cost of that, but also what happens once you’re into that system. If you go to prison and you come out, then suddenly you’re essentially locked out of the economy, [00:13:00] you’re not able to earn what you could have earned otherwise. So, we’re limiting our own economic growth, as well, through what we’re doing. That what I call is also a cost, it’s something that we’re not seeing as a cost, but it is. I’m very interested in the psychological side of all this, because that’s actually my own background, my degree is in psychology. All these studies that I feel relate to this fascinate me. One of the things that really fascinates me is this idea of [00:13:30] extrinsic motivation versus intrinsic motivation. That once you give people the ability, the power, to say no, then that really changes things psychologically. Not only can that power enable people to bargain up their wages for low demand jobs. Like, they would say, “I’m not going to work for $7 an hour but I would work for $15 an hour.” Or, “I’m not going to work 40 hours in this job that I hate, but I will work for [00:14:00] 20 hours, I could do that.” There’s so much more bargaining power available there. Aside from that, there’s actually very interesting affects on motivation. There’s an experiment where they gave people two tasks and they said, “Okay, choose between these two tasks and we’ll come back here and see how you did.” In another condition, they gave people those same two tasks and then just said, “Okay, you can do either of these tasks or you can do neither of them, you don’t have [00:14:30] to do them.” Then they left. So, what they saw is that people spent more time on the tasks where they had the ability to not doing anything. They spent seven minutes versus five minutes. This is something I think is kind of profound, how we view work differently when we view it as being our own, our own choice, as being voluntary. I think that we want to shift towards this economy where that’s what we’re doing. [00:15:00] If machines are doing more and more of the work, that work is actually usually mostly manual labour, it’s stuff that’s easily automatable. It’s not the stuff that’s more creative in nature. It’s this stuff that we can really accelerate. We can do more creative work. We are free to do that. In fact, that’s another thing that Dan Pink has looked at this, I recommend watching that Ted Talk video or reading about it, as well. Just how incentivizing tasks with money actually works well as long as the task is a [00:15:30] routine task that doesn’t require higher order creative thinking. If it’s just like a hard-labour task, money works for that. But that’s exactly the work that we’re automating, so what about the work that isn’t that? What about the work that requires creative thinking? There, money actually has the opposite effect, it worsens performance when money is used as the motivator. 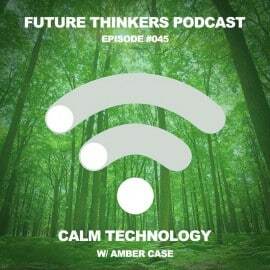 For this future economy, and even the economy now that we’re already shifting towards, we want people [00:16:00] to think more creatively, we want to motivate people intrinsically. People are interested in autonomy, mastery, and purpose. People are interested in being in control of their own lives. They’re interested in bettering themselves. They’re interested in getting better and better at something. They want a sense of purpose, they want to be doing something that they feel is more than just the task itself, the vision of something larger. It’s kind of looking at Maslow’s Hierarchy of needs, as well. It’s saying that if you eliminate people’s focus on [00:16:30] meeting their basic needs of food and housing and these kind of things, if you just cover those then there’s needs above that that are higher order needs that people can then focus on. Another experiment that I find fascinating is how they found that the effect of poverty is effectively like a mental tax. If your mind is always thinking about covering your next bill or how you’re going to be able to do this or do that, or if you’re working 60 hours a week or [00:17:00] whatever, your mind is scarcely oriented and you’re thinking very short-term. The decisions that you make are different. The comparative effect of that is a loss of around 13 IQ points, or it’s also comparable to being drunk or losing a night’s sleep so you’ve been up for over 24 hours. These are the effect on the mind that poverty has and that just constantly thinking of how you’re going to pay the bills has an affect on. 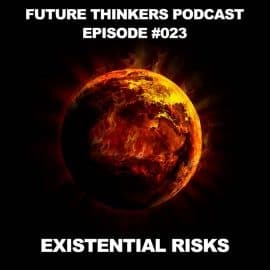 So, if we eliminate all that [00:17:30] then we can shift our entire society into a society that’s thinking more long-term and it’s very intrinsically motivated. It’s pursuing the work that is most valuable to each person. I would also argue that that’s the best work. People are so much more productive when they’re doing work that they love versus doing work that they loath. So, that’s what you want. Mike: We’ve had this discussion between ourselves quite a bit for the last number of years. Being entrepreneurs and working on different businesses and stuff and our finances being up and [00:18:00] down, kind of like you’ll have these weeks or even months of just total stress because you don’t know how you’re going to pay the bills. Then that makes you make stupid business decisions, which has happened to us many times. Then at some point in the last couple years we decided this podcast was something we were going to focus on, put all of our attention into. That’s been something we’ve worked harder at, there’s been more of enjoyment in life because of that. Euvie: It’s totally at the top of our Maslow’s Hierarchy, yeah. Scott: Yeah, I value this stuff so much more. [00:18:30] I actually, I’m a cable cutter, I don’t really watch cable TV. I actually love watching YouTube videos. I much prefer, essentially, the work that’s been done for free and I love that Patreon, which is what I use even myself, is a wage for people to connect directly with those who are creating the stuff that they most love. It makes so much more sense to me when people pursue what they want to pursue. I just love all of the stuff going on right now thanks to [00:19:00] the internet. It’s unfortunate that it’s unrecognized as work. You have a podcast that has 10 people or something, so that’s not work. But if you have a podcast that has a million people, then it is work. Why is that? If you’re just not known as well, it’s still work. You’ve got to start somewhere. People just need to be able to be free to pursue these things and they’ll get better over time and they’ll build their audiences over time. Before you know it, even people who don’t see it as work right now will see it as work. Also, to your point about [00:19:30] variance of income. One of the stats that I think is actually kind of scary is that in the US the bottom 20 percent of income earners, three quarters of that group, their incomes are varying 30 percent month to month. That’s a huge variance. If your total bills come to, say, $1,000, and you earn $1,000 one month. So, you barely cover your bills. The next month you earn $700. So, you’re unable to cover your bills. You’re doing the same work [00:20:00] but it just didn’t result in the same thing. That’s the difference from the way we work now versus the way we used to work. This is something that I think the older generations don’t get about the system now, is that they were raised in a full-time career economy where you would work 40 hours a week, your income would never vary, and you were able to do that for decades. Euvie: Stay in the same job [00:20:30] for almost your whole life. Scott: Right, right, and we’re not doing that anymore. We’re getting more and more away from that. We’re going to what’s called the atomization of jobs. Now, you can work for Uber if you want to and you could do two hours today and maybe a couple hours next week or maybe you focused on it eight hours a day if you want to. There’s so much more variability, there’s so much more even control that people can have over this but there’s also, like, you do have that control [00:21:00] if you have the ability to do, say, multiple part-time jobs and whatnot, you can patch that together. But at the same time, because we don’t have a basic income, a lot of this is done out of pure necessity, people don’t want to drive for Uber. Some do, some don’t. But the people you don’t, they’re doing it because they’re underemployed, they want to earn more money and they can’t because they don’t have this 40-hour week job or whatever. So, they have to do that. I don’t think that that makes any sense for this economy [00:21:30] that should be working better for us. I mean, technology enables us to have more control over our lives, but in order for that to really be true we have to make sure that people get that income so it’s true. Let’s make sure that people have an income floor, so that they can actually choose the way that they work. That’s why I think this is really about is just having more control over the work, and not only paid work but unpaid work, as well. Why is it that it counts as work if you get [00:22:00] paid to watch somebody else’s kid but not your own? It doesn’t make any sense to me. Mike: What are the arguments of some of the biggest detractors of basic income? Scott: Well, your common argument, we even saw this in Switzerland, too, is this belief that it’s too expensive and that if we could even raise the tax revenue, that it would be far too much for the economy to handle. That’s false. There are immigration fears and we saw these kind of immigration fears just with BREXIT and we’re seeing it [00:22:30] also with the rise of Trump. It’s just this idea that we’ve got to keep people out. So, if we had a basic income then everyone would flood over the borders and then the whole system would breakdown. That’s false as well. This varies, of course, according to implementation, but for the most part basic income is seen as an income given to citizens and possibly legal residents. Even in Alaska you have to live there for at least a year to meet the residence requirements [00:23:00] in order to earn the Alaska dividend. You don’t just move there and immediately get it. Just like if we had it in the US, I think the most likely the way it’d be set up is that you’d have to be a citizen. So, in that case, that actually incentivizes legal immigration. If the assumption is true, that people are going to come over the border in order to get the income, they have to actually have a social security number. You can’t just magically get money. This requires documentation. This would actually [00:23:30] incentivize people to go through the legal route, in which case, that’s what people want who are against immigration. So, I think there’s actually a good argument for basic income even reducing this xenophobia that we’re seeing because so much of it is born out of this fear and out of this insecurity, this, “They took our jobs,” mentality. If you’re the one, as a citizen, getting a basic income and therefore [00:24:00] you’re not forced to work, it’s not coercive, you just choose to work and you choose how to work, then you look at immigrants coming over. If they’re undocumented immigrants and they’re not receiving a basic income, you can look at that and go, “Okay. I’m okay with that because they’re not getting what I’m getting. I’m a citizen, they’re not. Sure, they can come over. 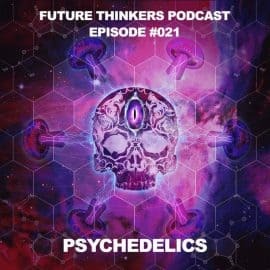 They can do the jobs I don’t want to do, great.” It really kind of changes the way that they look at this because it’s no longer, again, this scarcity mentality of, “[00:24:30] If they get something, I don’t get this something.” That’s how it is right now and that’s really what underlies a lot of our issues is that people think everything is this zero-sum game where someone has to not benefit in order for someone else to benefit. That’s not the case, everybody can benefit. Euvie: Another argument that I’ve heard a lot, and I used to be of this mindset, that if you don’t somehow incentivize people to work then they won’t work. But actually, I’ve totally come [00:25:00] over to the other side. I’d like to hear your take on this. Scott: Again, I would say those are the top three now that we’ve listed those. Yeah, there’s this worry that people won’t work. I like to base what I think off of evidence, I’m just weird like that, I guess. Scott: I like observing actual things and I love experiments and I love seeing how people actually behave. It’s fascinating, if you look into the results [00:25:30] of universal based income given where it’s been done in Namibia, where it’s been done in India. Even basic income like circumstances where, through unconditional cash transfers which is a tool that’s used more and more widely all over the world. If you look at these things, even with Give Directly, this charity that’s essentially giving away basic income and they plan to do a very long, 10 to 15-year, basic income experiment actually. If you look at all the findings of all of these, it’s actually [00:26:00] I would say profound to see the amount of entrepreneurship that happens under basic income. So, they found that people actually work more in these situations where, essentially, a lack of money locks you out of markets, it locks you out of your society. You’re not able to really do anything. But as soon as you have some money, at least some, now this essentially capital for the people, venture capital for the people. People have to have [00:26:30] something in order to do something, you have to have money to make money, this kind of situation. They found that people use this money to create businesses to a large degree. There was a 300 percent jump in self-employment in Namibia as just one example, and you see that everywhere. You see people actually creating businesses and the other flip side of this, as well, which is very important is that people are creating businesses, but because of universal basic income [00:27:00] they also have customers. So, all of these customers are created and they’re able to purchase the goods of these businesses that pop up. That’s where you see these great multiply effects, you see great development. You see people doing things that they weren’t able to do before. It even has an effect on the society as a whole. I’ve written an article about how basic income is bound to increase social cohesion. One of the first things that was seen in one of the experiments was that people pooled [00:27:30] their incomes together to create a community centre. They found that increases in income have pro-social affects, that people are more willing to work together. In India there was even more interactions between different casts that originally didn’t really talk to much together. All of a sudden, they found them working together. This is something that I think is an additional, incredible affect. This is also why Sam Altman is looking into this for why Y Combinator. He has recognized that potential on entrepreneurship and [00:28:00] small business. That’s his thing. He really wants to research this and spread the work even about this and show that it works and help make that happen, because he knows that a society with basic income is going to be so much more entrepreneur than it is now. And it’s really important to see that when we give people basic incomes, not only can they pursue the work that they’re essentially prevented from right now, but they can also pursue [00:28:30] all this unpaid work, as well. When you do that, it’s a very powerful thing. Look at what Wikipedia has done versus the old model of World Book and Britannica and stuff. They have become the world’s encyclopedia and it’s entirely free. How many more people are going to be pursuing this kind of work if they have a basic income? If an income is no longer required, if they don’t have to figure out a way [00:29:30] in order to pay for rent and pay for food, and they would just want to use that basic income and focus on this really meaningful to society unpaid work, they can do that. It’s like, come on. Really? Do you think that’s the goal of humanity is to be a walking billboard? There’s so much more valuable work out there for [00:30:30] people to do and they’re certainly going to do that. That person is not doing that because they love that job. Euvie: They’re trying to eat the next day. Euvie: Yeah. It makes me think about what kind of long-term effects it would have on people growing up in a society like that. Right now, if you ask a kid what they want to be, they have some insane cool idea of what they want to do, like, “I want to be an astronaut,” or, “I want to be a cat trainer,” or whatever. Then they grow up to be a tax accountant or something. Scott: I think what’s fascinating [00:31:00] for me is thinking about the explosion of creativity and innovation and entrepreneurship. I would just be interested to see the art and music that comes out. Scott: All of a sudden, my favourite bands who quit because they couldn’t make money in music would get back together. Euvie: Yeah, that’s a really good point. Scott: Yeah, and people can do that and still work. They can say, “Okay, instead of working 40 hours a week, I’m going to work 25 hours a week.” Which, by the way, is ideal for productivity, but they can reduce the amount of work in their job, [00:31:30] in which case, that would also equivocate to more shared work. If we’re worried about technological unemployment, then if there’s half as much work we can employ everybody if people worked half as much. There’s no reason why we just don’t work less as far as labour market goes. So, yeah, people can work a little bit less in the labour market and, at the same time, pursue these other things as well. Again, yeah, they could even pursue it full time, but that’s all their choice. They could choose to do these things which they don’t have [00:32:00] that ability now. As far as long-term effects, I think a really good example is what’s been going on in North Carolina. This is involving a dividend from casinos for the Cherokee population there. This has been going on for about 20 years now. It was this really fortunate circumstance where there were researchers there that were studying poverty, they were studying low-income groups and a few years later suddenly the Cherokee started [00:32:30] giving out dividends to everybody who were Cherokee. Those people and their kids, their kids were already in this group that were being studied. So, it created this really interesting natural experiment that just was very serendipitous. The most recent studies are fascinating to see the long-term effects that have happened. So, some of this is that there was actually a decrease in alcohol use in these families. They found that because these families argued less about money, which of course people widely know [00:33:00] is that’s kind of the thing that we most argue about. So, if you take that off the table, or at least reduce it, these were amounts that were about an extra $4,000 a year on average. It’s a third of a basic income as far as I would qualify it in the US. If they get this extra money and they found that the parents essentially became better parents. They were able to focus more on their kids. They spend more time with them, they were less stressed out and this had an affect on the kids [00:33:30] that was pretty profound I would think is that these kids ended up having personality differences. They showed more agreeableness with other kids. They showed more of a propensity to work together. They were more, again, these are pro-social affects of a result of this. There’s this hypothesis that personality is more plastic in youth and as you become and adult it hardens and your personality kind of sets. As a child, [00:34:00] if you’re more willing to work with other people if you have these other personalities that we actually, I would say, want to create that sets in. As adults, they have these more pro-social personalities and, of course, they will have kids and their kids will have more pro-social personalities, especially if, again, their poverty is eliminated or, at least, reduced. This is a very long-term affect and result of basic income. Mike: How do you see a transition happening? [00:34:30] That’s probably the biggest hurdle we have to get over is how would this possibly be a discussion in congress? Scott: Yeah. I do think that the main barrier at this point I would say is just a lack of knowledge of the idea of basic income and its possibility. There’s just so many people who don’t know about it yet, especially in the US, but all over the world depending on what country you’re talking about. But we do need people to know about this idea and they need to be talking about it. We’ve seen that [00:35:00] there’s actually a correlation between how much you know about it and how much you like the idea. So, the more you know about basic income, the more you like it. That’s just how it is. There’s a few people, a very few people, who learn more about it and decide they like it less. So, the important part is educating people and getting it out there and spreading awareness. So, that’s step one, immediate step. Now, step two, again, I do think it’s going to be more bottom up, but you do need to start somewhere. So, you get enough [00:35:30] momentum for basic income and then you start with some kind of smaller foot in the door kind of thing I think, at least in the US is that I really like the idea of a carbon fee and dividend. Or, essentially, we could do basic income and we could start small with a smaller amount. It would be you add a price to carbon, therefore disincentivizing its use and, at the same time, negating the regressive nature of that [00:36:00] by providing the income gain from that to people. If you do that, the result is actually an increase of income for the bottom two thirds, which is the top one third. Because people with a larger carbon footprint are those with more money, it’s just how it works out. That’s a policy that I think is kind of a two birds with one stone kind of thing. We need a carbon tax as soon as possible. The most political way of doing that is to do it with a relevant neutral way, which is giving the money back to everybody universally. That’s a way of starting [00:37:00] now and starting small and growing it. Again, with the carbon fee and dividend, another thing is that you would ramp it up year after year so the amount would grow year after year. Then, let’s say if you’re at $200 or $300 a month in a carbon dividend, then, again, you only have to raise an additional, say, $700 per month to give everybody a basic income of $1,000. We can start now and save money when we do do it. That’s one way I think of getting a foot in the door but there are other ways, [00:37:30] as well, that may even work better like maybe in the US we could start doing an enlarged enhanced EITC, which would be essentially transforming the earned income tax credit more like a negative income tax. Euvie: How would that work? Scott: The way that the ITC is designed right now is that, unfortunately, you have to be earning some form of income and then you get this boost in that income. Then it goes up to a certain point [00:38:00] and then you start slowly losing that boost until it’s gone. That varies by household size and it’s virtually nothing if you don’t have any kids. But if you expand that, if you say, “Okay, we’re going to give it, as well, to people without kids and we’re going to make it bigger and we’re also going to say that it goes to those who aren’t working, who aren’t earning any income that they would get this, too,” then that is essentially this negative income tax [00:38:30] that we talked about in the 70s. Which is, again, it’s very similar to a basic income, the only difference is that a negative income tax, you pull the money away from the basic income that you’re giving essentially. Those with higher incomes would receive less of the amount versus a universal basic income which is everybody receives the same amount but then the [inaudible [0:38:52] is through the income tax system so that a billionaire would be paying, say, four hundred million dollars in [00:39:00] taxes but they would still be receiving $12,000. They’re paying far more into it but they’re still receiving it. So, I do believe the UBI makes the most sense and I think that that’s the aim or ultimate goal is that we should be doing. But I do think that we could go that route potentially as a foot in the door starting point situation just to work in that direction. EITC is something that is considered very popular in the US for decades. There’s no reason [00:39:30] why we couldn’t agree to that being a first step as long, again, as we decouple the earned income part component, which I think makes less and less sense in a technological unemployed world. We’ve got to severe that connection between working income. So, people without any income should be able to receive something and that’s really important. What about platforms like Patreon? Scott: Yeah. Patreon, I use it and I just immediately love that concept [00:40:00] of this Kickstarter like platform where people could earn incomes directly from those who love the work that they’re doing. People think, for some reason, that with a basic income, “You’ll be creating a population where there’s a whole lot of people who are only earning the basic income and that’s it.” They’re ignoring all the ways of earning income on top of it. Patreon is a great example of a way for people to earn this additional income through the work that they’re doing. [00:40:30] So, you’d have your basic income of, say, $1,000 a month and then you’d be able to, through Patreon, earn an additional $1,000 a month or $2,000 a month even, or $3,000 or whatever. This is an additional way of earning income. I created the big Patreon creator pledge, which is this idea that you crowd fund basic income like I have and any surplus that you earn over that, you distribute to those who have [00:41:00] promised to do the same. So, what I’m trying to do is kind of crowdfund basic incomes for people right now. It’s only the beginning of that and it’s theoretically possible. I’ve done it and I know other people will do this, as well. I would like to see more people interested in this, as well, but I think for the most part it’s harder to do because right now you don’t have that income floor. So, people want to [00:41:30] keep as much of their earnings as they can. It’s hard to give away that surplus. It takes, like I’ve done a pledge, you have to decide that $1,000 a month is enough and that you want to make sure that everybody else has $1,000 a month, too. It’s more difficult. It’s possible but it’s more difficult and I would love to see more people do it. Euvie: We’ve also started doing Patreon a few months ago and it’s been growing every month, which is really awesome to see but it’s not nearly enough yet. Scott: Yeah, that’s great. 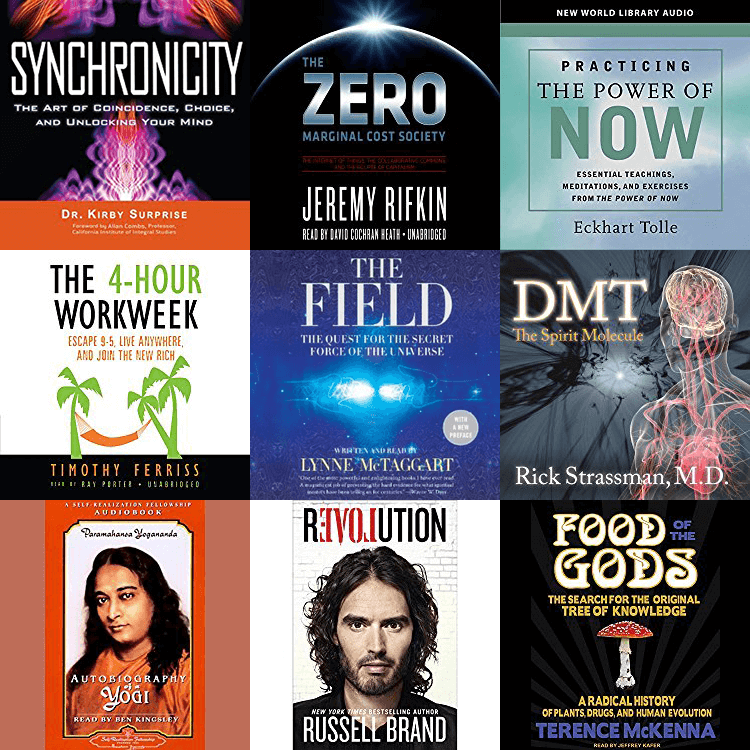 [00:42:00] It was a year for me to grow from zero dollars a month to $1,000 a month. It takes time and, again, it takes a lot of work. Another thing I learned is that it’s not only one kind of work. So, yeah, I was writing and you guys are podcasting, but the other part of this is that there’s so much marketing you have to do. You have to do your own marketing. No one’s doing it for you, so you have to build your social media presence and you have to get out there and make sure that everything [00:42:30] that you do has as many eyes or ears as possible. All of that takes time and it takes time away from doing the stuff that you would prefer to be doing. But, again, it’s all on you if you are unable to focus on it fully, like if you’re having to do a part-time job or even a full-time job, I would say as your side gig because your main thing is what you most love. So, your main thing is podcasting and your side gig or whatever. Any work elsewhere slows down your progress [00:43:00] on what you’re most passionate about. Euvie: It’s so true. I recognize that there are so many benefits to basic income, but I wonder if there are any down sides that you see. Scott: Yeah, I get asked that question a lot, too. I see this as an eye of the beholder issue. So, again, I look at the experiments and there were people that did not like the basic income in Namibia and even India. [00:43:30] The people who didn’t like it were the money lenders, they were the people who earn their incomes essentially off people not having income. So, that’s one thing and another thing why people didn’t like it were those who owned their larger farms and they were looking for workers for those farms. People, again, because there was this huge jump in entrepreneurship, people shifted their work from the labour market to being their own employers. [00:44:00] People just, I feel a lot of people want to do that and they can’t. So, if you are an employer and the work that you’re offering to people is low demand work, it’s work that people don’t like to do, then yeah, you’re going to have to pay more in order to attract that labour. They’re not going to like that but that’s not all employers either. Some employers are going to be able to have to not offer as much money and, even with start-ups, right now what’s preventing so many start-ups from happening is that [00:44:30] you have to fund the venture capital in order to fund your group of people, your core group, and suddenly with basic income people can actually not have to raise that funding because they already have enough to live and they can just devote their work to creating this new idea and they don’t even have to be paid. They can be paid when it becomes profitable. That changes the situation. You can actually have labour that’s less paid and you can have paper that’s more paper, even if [00:45:00] they’re just even poor employers like let’s say just people don’t like them. Let’s say the work might not be bad but let’s say they’re just not fun to work for. Then they’re not going to like basic income and they’re going to see this as a negative because it affects them negatively. I think if you take the big picture, then I don’t see that as a negative. I think they just need to change the way that they behave. I think they need to offer better incentives and I think they need to be better employers. I think that’s better for everybody. But, again, they won’t [00:45:30] see it that way. Another thing I want to mention, too, is that this idea that people will do nothing but stay at home and watch TV or play video games or whatever. I just want to look at that for a moment, because I think that we’re wrong about the way that we see that. Bertrand Russell wrote this great essay called In Praise of Idleness. At one point, he mentions this idea of why is it [00:46:00] that work, like the products that we do and the services that we do, why is that the baker is seen as doing something good and all that work is good and the bread is good, but then the people who eat it and the act of eating is bad? It doesn’t seem to make any sense, it’s like saying that keyholes are good but keys are bad. It’s like, they’re two sides of the same thing, you need that. What is the point of doing everything that we’re doing if we can’t enjoy it. [00:46:30] If you even have someone who does no work in the labour market and they’re just consumers, they are paying for that, they are consuming and they’re even paying in value added tax that they’re paying in sales taxes, they’re paying other taxes. They’re still paying into this and they’re actually buying these products that wouldn’t otherwise be purchased. It’s amazing to me that we’re spending over 100 million dollars building video games right now. They’re bigger than movies and they take [00:47:00] years and then why is it that playing them is seen so badly. It doesn’t make any sense to me, especially when I look at YouTube, as well, that if you look at just what people even learn from these things, like no one is just sitting here watching movies 24 hours a day for their entire lives. You’re doing it for some purpose, you’re getting something out of it. Even, I think Quentin Tarantino is a good example of can you imagine if you were somebody who’s judgemental and you’re seeing Quentin Tarantino [00:47:30] watch all these movies. You’re just looking at him and you’re going, “Gosh, you’re so lazy. You’re not doing anything, you’ve been watching movies.” His movie watching informed everything after that. At some point, he started creating movies and he started creating movies because of everything he watched and he learned for everything he watched and that’s what he put back in. So, he consumed from society and now he’s a massive creator of stuff that people love to consume, as well. So, there’s this inspirational affect, there’s this learning, [00:48:00] there’s so much that goes on in these video games and movie watching and whatnot that we don’t value that I think that we should. Euvie: Thanks so much for joining us today, that was fascinating and so great to hear about all this. Mike: Yeah, I think we could actually talk a lot more about this. Maybe we’ll have you on again sometime in the future. Euvie: That would be cool. Scott: That’d be great. Thanks so much for having me, guys, and thank you for doing what you do. Mike: Thank you to you, as well. Take care. The idea of Universal Basic Income (UBI) – a liveable amount of money given regularly and unconditionally to every resident of a country – is not new. Humanist philosophers More and Vives laid proposed the concept of giving people a minimum income back in the Renaissance era in the 1500s. Several other philosophers have contributed their ideas on the matter since then, from the republicans Condorcet (1794) and Paine (1796) to the utopian socialists Charlier (1848) and Mill (1849). In the 20th century, the idea of raising the income floor gained more traction, and many prominent thinkers theorized how it could be implemented. People from all over the political spectrum have advocated for and supported the idea. Liberal, conservative, socialist, anarchist, libertarian, green, and other. Among them are nobel laureate Bertrand Russell, economist Milton Friedman, activist Martin Luther King Jr., economist Friedrich Hayek, and architect and futurist Buckminster Fuller. 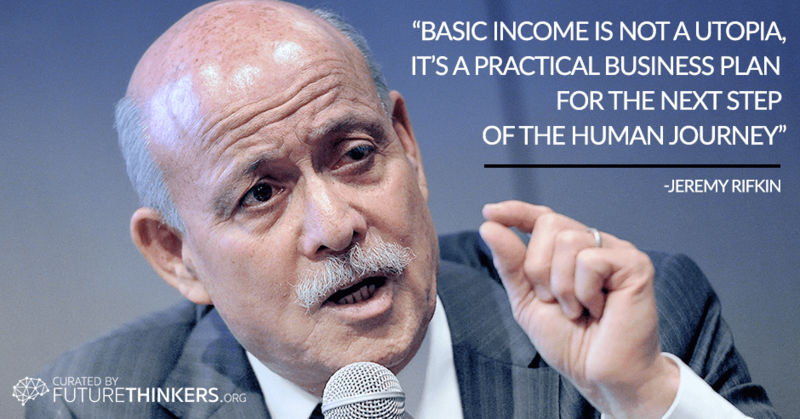 More recently, prominent basic income ideologists have been professor Guy Standing and economic trend analyst Jeremy Rifkin. Among the famous supporters of the idea are Paypal founder Peter Thiel, 2016 US presidential candidate Bernie Sanders, entrepreneur and futurist Peter Diamandis, Y Combinator founder Sam Altman, and physicist Stephen Hawking. Basic Income Experiments: Can It Work? Since the 1960s, several experiments have been carried out to test whether universal basic income is a viable idea and to find out what the real-world effects might be. Several negative income tax pilot programs were conducted in Canada and United States in the 1960s and 1970s. The Alaska fund dividend is one of the longest running basic-income-like experiments and has been in place since 1982. More recent experiments with unconditional cash transfers have been carried out in India, Namibia, and Brazil since 2008. Some of the recorded effects of giving people free money regularly have been very favourable. There was less crime, people’s health improved, people actually worked more and there was a significant rise of entrepreneurship (a staggering 300% increase in one experiment), there was less alcoholism, high school students stayed in school longer and were less likely to get pregnant. It’s difficult to know what the long term effects of giving people a basic income would be, and if the positive effects would persist. One charity called GiveDirectly is trying to get long-term data by giving people unconditional cash transfers for periods of 15 years or more. 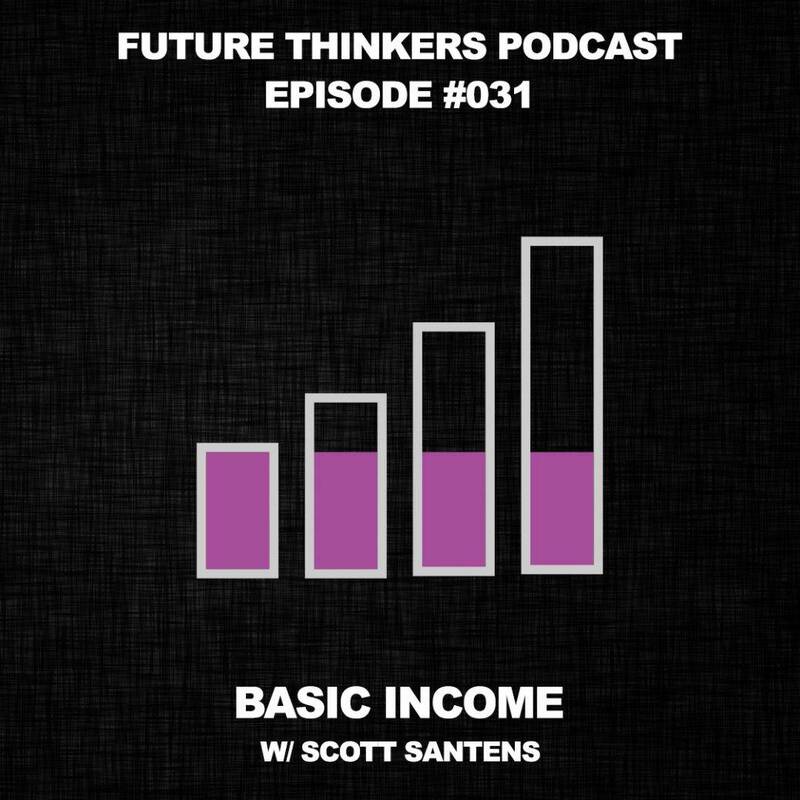 In this podcast, writer and activist Scott Santens answers our questions about how universal basic income would work, what its benefits and downsides are, and how societies can implement it. Are there any recorded downsides?